Surprisingly for this traditionally slow weekend, two new films make it the multiplexes, and one of them even stars some people we've heard of! All this and more in this guaranteed “leftover” pun-free forecast. Few studios dare to tackle the week after Thanksgiving with any kind of substantial film, figuring that people have had their fill of movies during the holiday period. Additionally, with as lucrative a weekend as Thanksgiving can be (though this is becoming less true), why release a film you have confidence in after that weekend when you can release it before, on a weekend that can handle just about as many films as you can throw at it? So, with a kind of self-fulfilling prophecy, few films of any note ever appear, and often the weekend is barren of new films. The all-time highest grossing new film on this weekend is The Last Samurai, with a mere $24 million on the back of Tom Cruise, not yet Tom Cruise Crazy. 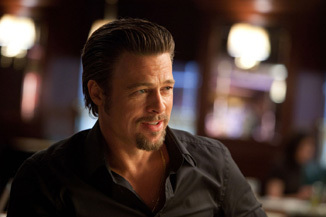 Brad Pitt, a star with perhaps as much marquee value as Cruise, headlines the one of two new releases this weekend in Killing Them Softly. That's a really terrible title for a gangster film, even with a big name attached, even if it is kind of explained in the commercials. Pitt plays a mob enforcer who is hired to recover money stolen from an illegal card game, an action which sends violent shock waves through the local criminal underground. Because this was apparently not enough plot, this is also happening amidst the backdrop of the 2008 Presidential election, and apparently draws parallels between the two events. Isn't this the kind of thing The Naked Gun 33 1/3 specifically made fun of? In addition to Pitt, the film also has a solid tough guy supporting cast, including James Gandolfini, Ray Liotta, Sam Shepard and Richard Jenkins, and is directed by Andrew Dominik, who knows tough, having helmed Chopper, and Pitt, who starred in Dominik's The Assassination of Jesse James, but hasn't ever really known commercial before. This gets some of the way there, and has strong reviews, but on the surface it's a not particularly special looking crime film that just happens to have an A-lister in the lead. Although Pitt can't take credit for all the box office of his films, there's rarely a bomb in his CV when he decides to go commercial, and we probably have to go back to 2003's Sinbad before something he was strongly associated with did really poorly relative to expectations. Since the budget here is just $15 million or so, those expectations still aren't very high. And with the Weinstein Company backing it, we can dial down those expectations a little further, as they've still never gotten their groove back in the promotions department since leaving Miramax. Factoring in the post-Thanksgiving opening, I think we can see a start of around $16 million here.